“I want you to know I love you. I love our boys. It’s been two years since my husband, Zack, said those words to me. I will never forget them; the last words he ever spoke to me. After that two minute phone conversation, he shut his cell phone down. He then committed suicide in a remote field, an hour from our home. It wasn’t immediately known that he had taken his life after a brief, but acute, mental breakdown. In fact, it was a week of search parties, frantic phone calls and heavy media coverage before a farmer found his body. A crash and burn of the safe life we had known. Since then I have been trying to rebuild a new life for me and our three sons. The past 24 months have been a blur of pain and hope. Friendships and relationships have been lost and gained. My faith in God has been shattered and rebuilt. I’ve experienced some of the most tragic…and most beautiful…moments of my life. I’ve been fortunate to receive some of the kindest gestures. The boys have grown up so much in two years. They have seen and experienced pain and anxiety no child deserves. But kids are resilient by nature. No matter how sad life gets, their hope of better days to come remains steadfast. Their innocent hope gives me hope. When Zack first died, I didn’t think I was capable of caring for the boys by myself. Homework, bath time, bedtime, hectic mornings before school and work, my career. How could I do it alone? How could I work and take care of the boys? Just the thought of it all overwhelmed and exhausted me. But I forced myself to slowly adjust. I didn’t have a choice, and I knew the boys needed me now more than ever. They kept me going every time I wanted to shut down and quit. Two years later we are doing better than just surviving. I love my career. The boys are doing well at school. We have lots of friends and people who care about us. We are healthy. I try focusing on all the good in our lives, There is so much of it. I have accepted the fact that the pain will always be woven into our lives. Every milestone the boys achieve is bittersweet. But I remember those last words he spoke to me. “I will always be here.” And I have to believe that’s true. I have to believe that somewhere, he is watching over his boys and witnessing all of their joy and accomplishments. depression…take it seriously. It could be a life or death situation. Zack was the kind of guy who knew no enemies. The kind of guy who showed up for everything five minutes early and never once forgot Sweetest Day. The guy everyone depended on. If the darkness could overtake him, it can happen to anyone. So tell your family and friends how much you love them. Never take a single day for granted. And always be kind. You never know the struggles of others. If you’re unfamiliar with the story, you’re welcome to start with this post. My heart and spirit have a special connection with Jeannie, and to Zach, even though I never met him. I don’t know how all or even some of these things work, but I know it’s real. Thank you, Jeannie. Just…thank you. Thank you for the update Jeanne (and Gigi!) – I think of you and your journey often. how fortunate your beautiful boys are to have you! I will continue to wish you all peace and joy. Thank you Jeanne for sharing your journey, May peace be always with you. Jeannie: I pray for you and the boys constantly. Jeannie, you are such a strong woman. Your boys are so lucky o have you as a mom and I am so glad that they are keeping your spirits up. You all deserve happiness and peace. I think of you all and will continue to send you good thoughts and best wishes. A – Jeannie presents strength to the world and she truly is inside. This I know. Jeannie, I am in awe of your strength and perseverance. Your boys are so very lucky to have you as their mom. Taylor – ITA, they got an amazing mom in Jeannie. This is so strange opening up your blog and seeing this post today of all days. I just learned early this morning a very long time friend died last night leaving a beloved wife and his two young children. My heart is breaking for his wife and the kids and to see this post….another reminder to take nothing for granted. cmg – I'm sorry to hear about your friend. It's difficult to wrap our minds around unexpected events. Well, expected ones, too. Thank you for chiming in. You are amazing, Jeannie. Truly amazing. Such a beautiful post, it brought tears to my eyes. I just try to remind myself how lucky I am and not to take everything for granted. Thank you to both of you! I understand what you are feeling and going through. I too lost my husband to suicide. I believe that mental illness and alcoholism was involved. It has now been some time since my boys lost their father and they are doing well. Thanks for sharing your story. Maybe this will show others that you will and do survive one step and one day at a time. Jeannie, I am so glad that you published this. I have thought of you and your boys often, and I know that you struggle, but to see your light shining so brightly here, today, is what I consider the literal definition of hope. You found your way from the darkness of losing someone so lovely to something so awful, and with strength and perseverance. Thank you for showing us your journey. One of my closest friends I had known for over twenty-five years killed himself last December. I spent nearly a month in shock and sadness, and now that his (what would have been) fortieth birthday is approaching, I feel the pangs of grief and sorrow all over again. I wish there was more I could do to prevent suicide and raise awareness for survivors of suicide, but in the meantime, I will start by continuing to pray for you on your journey. God bless you and your family, Jeannie. Jeannie I've thought of you often these last two years and I think you've done an absolutely incredible job just coping but also taking care of your boys, you are truly an inspiration. Just getting up and doing it everyday. Thank you Gigi for hosting this update from Jeannie, you are the rock and hugs to you too. Jeannie, I was just thinking of you yesterday. I'm so glad to read this today and know you and your boys are doing well. It's unthinkable and tragic- it hurts so much to hear of and its all too desperately frequent. Rejoice in your family and friends and the love you share! Be well. Thanks for sharing this Gigi. Jeannie, I wish you continued strength. I pray your boys continue to be your strengths always. Your grace and love and hope is marvelous, and your family is so precious. Peace and prosperity. Jeannie, I'm so sorry that Zack was overpowered by this terrible, insidious disease. Depression and related anxiety illnesses have been destructive presences in both my and my husband's birth families. I know how deceptive the symptoms and effects can be, even to the person suffering them, and how important it is to help educate others about depression so that fewer families suffer as yours has. Thank you so much for sharing, and helping to get this vital information out. I too have often thought about you and your beautiful sons these past two years, and I'm so happy to hear (and see in your wonderful Instagram photos) that you're all beginning to find a little "new normal" and even some sparkle and joy in your days. You've shown amazing courage and strength under terrible circumstances that would knock a lot of people down, and when you have moments of self-doubt like all of us mothers do, look at your boys. They are spectacular evidence of how well you're doing. I hope there's a boatload of much-deserved happiness ahead for the boys and for you. And Gigi — you're just awesome. I'm really glad I found you and this oddly real but undoubtedly authentic community of JCA's. XOXO to both of you amazing women! Thank you for sharing your journey, Jeannie. Best to you and your boys. And as always, thank you Gigi – you and Alexis have really fostered such an amazing community in JCA's. Thank you for sharing, Jeannie. I have thought of you and your family often over the past couple years. I am so glad to hear you are all doing well. Wishing you and your sons continued strength, health, happiness and hope. 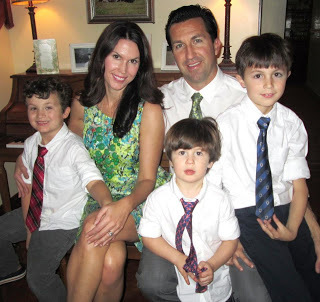 Thanks Gigi for hosting this guest post and keeping us all in touch! You are the best. Jeannie-I have thought of you often and am so glad that you have taken the time to share your continued journey with us. 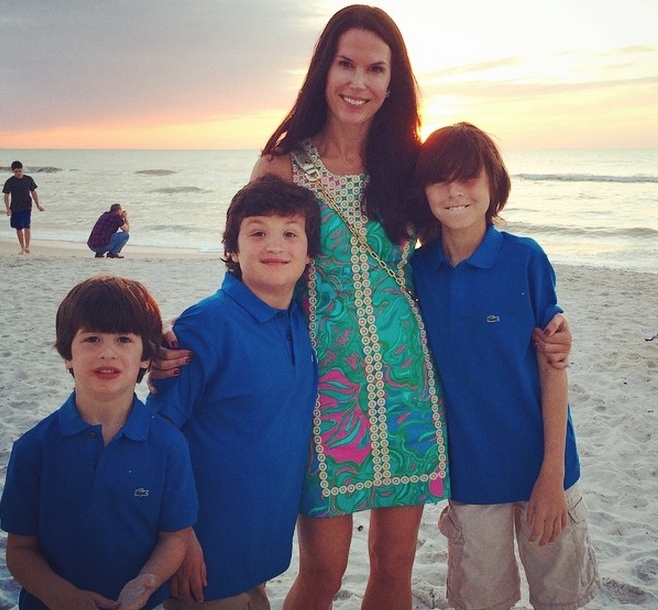 Those three beautiful boys have one amazing mother! Your courage, perseverance and strength are an inspiration. I wish you all happiness, joy, inspiration and fun! Gigi-you always bring heart and soul to the JCA community. Thank you! Jeannie, I have thought of you and your boys frequently. You're showing exemplary courage and love to your sons and the rest of us. I hope that you are finding peace and joy in each and every day with the boys.